I've been working up a journal to give my hair stylist for Christmas. She's an avid huntress who did not have the best luck this year. 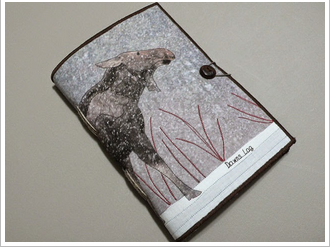 I'd told her about the issue I ran into when thinking to use my moose photo on a padfolio with the nose ending up on the flap and...oh no - the moose's rear on the front cover. She laughed and thought that might actually be fun. Most often she writes about quilting but always she shares both details of her process and the thinking behind her work. This post also has some great hints for simple bookmaking tools.